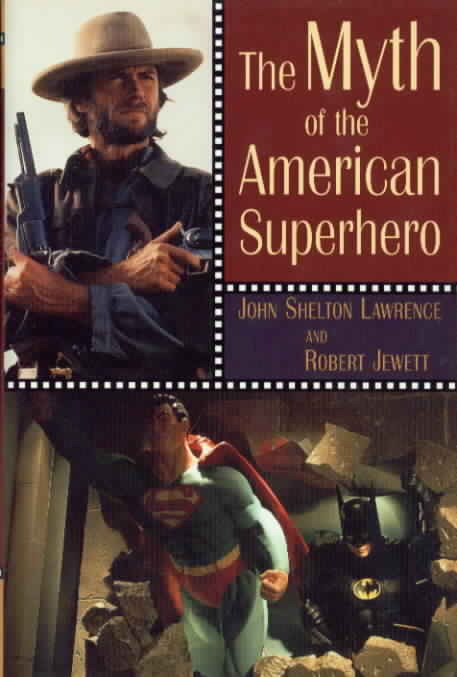 John Shelton Lawrence & Robert Jewett: The Myth of the American Superhero, Eerdmans, 2002. Gerard Jones: Killing Monsters: Why Children Need Fantasy, Super Heroes and Make-Believe Violence, Basic, 2002. Is violence okay when it’s only make-believe? And what is the relationship between imaginary violence and violence in the real world? Questions such as these have nagged at parents, educators, and pundits for years, and the events of September 11, 2001 have given them a greater urgency than ever. Two new books explore the question of fantasy violence from very different perspectives. In The Myth of the American Superhero, philosopher John Shelton Lawrence and New Testament scholar Robert Jewett claim the myths and legends that have defined the American imagination are quite different from the stories that have shaped the imaginations of most other cultures. Whereas the ‘classical monomyth’ usually concerns a hero who leaves his community in order to face tests and develop skills that he can then bring back to the community, the ‘American monomyth,’ as Lawrence and Jewett define it, typically concerns a selfless superhero who rises up from obscurity and rescues a threatened community after its own institutions have failed to do the job. Once the community is restored to its original state of paradise, the hero fades back into obscurity. The typical American hero, the authors argue, is concerned about his community but never practices citizenship; he acts outside and sometimes above the law, and the popularity of this sort of story, the authors fear, could undermine the public’s faith in democratic institutions. Such stories, they argue, may also encourage American unilateralism in the war on terror; if America, as a nation, sees itself as a selfless superhero, it may not feel it needs to justify its use of force. Most of the stories the authors look at concern violent male heroes of one sort or another, from cowboys to Jedi Knights, but the authors also look at the female heroes of Heidi and Touched By an Angel, who bring about happy endings through controlling love and psychological manipulation, and also usually without the help of churches or similar institutions. The authors do a thorough job of showing how real life is often transformed into myth, by contrasting the facts about various famous individuals with the stories that grew up around them. They trace this process back to Buffalo Bill Cody’s Wild West shows, and they show how it continues in films and TV shows that are ostensibly based on the lives of people such as Scottish rebel William Wallace (Braveheart), American settler Laura Ingalls Wilder (Little House on the Prairie) and Abraham Lincoln (The Young Mr. Lincoln). But the authors are on shakier ground when they suggest that particular films or books or video games may be somehow responsible for school shootings, vigilante activities and terrorist attacks. If Lawrence and Jewett are primarily concerned with the political consequences of fantasy violence, Gerard Jones is more concerned with the role that fantasy violence plays in children’s psychological development. Jones knows whereof he speaks. He was a pop-culture analyst before he turned to writing comic books himself, and back in the day when I collected comics, Jones was one of the most interesting and thoughtful writers around. In a special holiday-themed issue of Green Lantern, he even explored how modern celebrations of Christmas no longer acknowledge the bloodier aspects of that story, including Herod’s slaughter of the innocents and the fact that Christ came to die for us. In his new book, Jones makes a compelling case that fantasy, including fantasy violence, is a necessary and healthy part of growing up. Children need a safe place in which to cope with their weaknesses and explore their strengths, and fantasy provides this. Jones dissects the arguments of David Grossman and others who have argued that movies and video games encourage children to be more violent, and he shows how the studies themselves often tend to generate the anxiety that the researchers are looking for. He also notes that hysteria over the harmful effect of, say, video games is nothing new; in 1982, when games like Centipede, Pac Man, and Space Invaders were all the rage, Surgeon General C. Everett Koop asserted that video games were a leading cause of domestic violence. Children, Jones says, are trying to establish clear boundaries between their fantasy lives and their real lives, and adults who refuse to recognize a distinction between play fighting with real fighting make it difficult for them to do that. Adults who try to prevent children from indulging in fantasy violence are often projecting their own fears onto their kids, he argues, and thus cause children to become even more afraid of themselves than they already are. Jones does recognize the dangers inherent in movies and video games, including the possibility that people will become so lost in fantasy that they may have a hard time coming back into the real world. But he stresses that it is important to set aside our assumptions and to listen to children to find out why any given story or game is important to them. Adults may stress the literal meaning of a fantasy; but children, Jones argues, are more interested in the fantasy’s emotional or lyrical meaning. In other words, when a child pretends to shoot you, he is not saying he hates you or expressing a desire to become a killer. He is inviting you to share in a fantasy that gives him a sense of power; and the best thing you can do for that child, Jones says, is not to lecture him about the evils of real-life violence — but to share that fantasy, affirm your child’s imaginary power, clutch your chest and play dead.